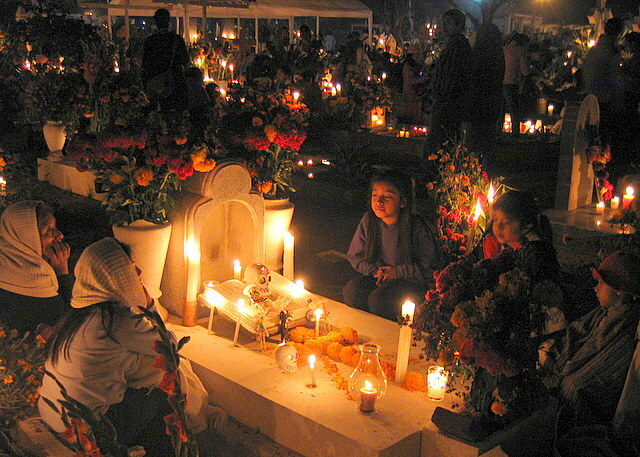 While folks farther north are being bombarded with images of pumpkins, witches and ghosts, here in Oaxaca we are preparing for one of the most important celebrations of the year, the Days of the Dead. This holiday is a unique blend of the native custom of honoring deceased ancestors and the Christian celebrations of All Souls and All Saints days. The people here believe that the souls of those who have passed on return on these specific dates to visit with their living family members. In order to honor these guests, a special altar is set up in each home with food, water, and things that were enjoyed by the deceased. Some people believe that if they do not set up an altar, the souls that return will chastise them. It is also customary to decorate the tombs in cemeteries, and candlelight vigils take place on the nights of October 31st, November 1st and 2nd. Although the customs of Day of the Dead may seem to some as somewhat morbid, in practice it is a lovely custom, at times solemn, at times celebratory, of remembering those that have gone before. It serves as a reminder for us of what Oaxacans have always known – that as long as we remember our loved ones, they are never really gone. Read about what you can see and do on Day of the Dead in Oaxaca, or join us for our >Day of the Dead tours.